OLDRIGHTIE: The Gloating, Goading Filth Of The BBC. The Gloating, Goading Filth Of The BBC. Any Violence Against The English To Be Glorified. 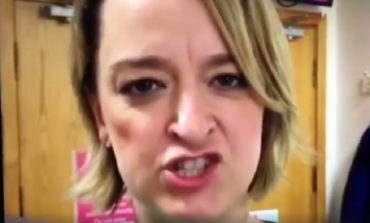 If ever a face epitomised the vile nastiness through an expression, the one above fits to a tee. We are enduring a vitriolic tirade day in day out over the failing of the British people to cower before the establishment mouthpiece. No doubt huge bonuses, promotions and wealth through notoriety and bias reduced as the people charged with the propaganda has failed spectacularly. Rather than keep President Trump from becoming a reality, they added fuel to the resentment of a bullying, leftard mantra alienating millions by its hectoring, smug delusion in its own superiority. The total certainty and slavish belief in polls, as the holy grail of soothsaying, kept the Brexit flame glowing in the dark of a mushroom cellar. One built by the cretinous Camoron crew in thrall to a global Establishment. One soothing the anxious furrowed brows of the Merkalite Sturmbannfuhrer SS at a cost to us all, no doubt of billions. Still these grotesque modern purveyors of snake oil carry on oblivious. Probably smirking at the letter from MPs flagging up how millions feel about a tax funded propaganda machine to make Goebbels envious and seemingly an amateur. Yet this very week a murderous, evil butcher of a thug died comfortably in his bed without a trace of remorse for those he tortured brutally and sadistically to satisfy his own twisted awfulness. One befitting a whole series of "Criminal Minds" lust for cruelty. The death of McGuinness is perfectly summed up by a noble and much maligned Englishman, Norman tebbit. A man even the BBC have a smidgen of fear for his outspoken truths and common sense. I feel that of all the decades I have been forced to swallow the unpalatable, vomit inducing outpourings from Bliar's BBC this past few hours of hero worship, pushed to the hilt by this home wrecker of an interviewer, Derbyshire but one example of the very worst of this organisation of terrorist apologists. If ever history seeks a present day version of the worst of propaganda pushed by the West's tame media, this full on beatification of this little piece of nastiness and his peaceful and for millions timely, early demise, screams foul. The atrocities and civilian slaughter in Mosul is ignored ignored, though even greater than anything seen in Aleppo. The latter used as a bloody cudgel to hammer the legitimate regime of Assad and his Russian ally but the propaganda dropped when its a Western turn at the machine gun nests and cluster bomb forays. Hypocrisy now a currency of choice and desire by our erstwhile but smelly leaders. A hypocrisy happy to savage any Nation or cause so long as its conducive to Western arms dealing and lust for power over others. Am I alone in seeing the double standards applied to McGuinness and his dreadful sidekick, Adams whilst seeking to depose an elected ruler in Syria? A plague on all their houses but the greatest on our media led by those little minds in the BBC. This Gina Miller woman is now pontificating over the fate of the United Kingdom. I can tell her now, it will be stronger post Brexit than any time since Bliar and Brown sought to use devolution to destroy any opposition to Labour's time in power. Look how that's turned out. If I might offer a crystal ball prediction. 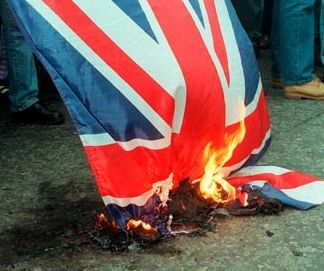 If any part of the UK does secede, it will be Northern Ireland. Only if, however, the Irish wish it. Again very unlikely! So this Gina Miller can go play elsewhere in Europe. Perhaps when Marine Le Pen invokes a French Article 50 notice.